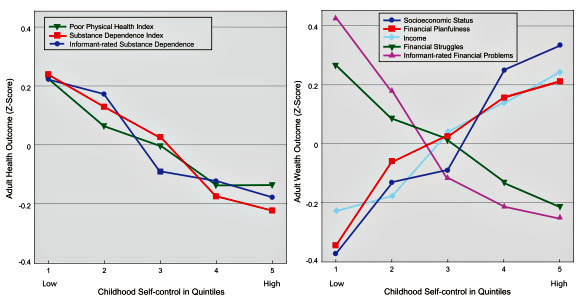 Childhood self-control predicted adult health problems….elevated risk for substance dependence….less ?nancially planful….less likely to save and had acquired fewer ?nancial building blocks for the future….struggling ?nancially in adulthood….more money-management dif?culties….more credit problems….more likely to be convicted of a criminal offense. Adolescents with low self-control made mistakes, such as starting smoking, leaving high school, and having an unplanned baby, that could ensnare them in lifestyles with lasting ill effects….Thus, interventions in adolescence that prevent or ameliorate the consequences of teenagers’ mistakes might go far to improve the health, wealth, and public safety of the population. On the other hand, that childhood self-control predicts adolescents’ mistakes implies that early childhood intervention could prevent them….Early childhood intervention that enhances self-control is likely to bring a greater return on investment than harm reduction programs targeting adolescents alone. The policy implications here remain to be worked out, but it’s yet another indication that the benefits of intensive early childhood interventions go far beyond academic achievement. Even if early childhood programs have no lasting effect on school test scores at all, they might still be immensely valuable if they improve levels of self-control. The question is, what’s the best way to do that?